It is not uncommon for the little toes to become bent up, or “clawed”. 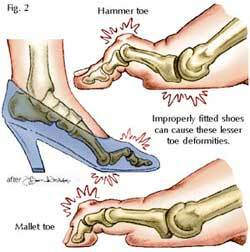 Another term is a mallet toe. This deformity can cause problems with pain under the balls of the feet, corns on the top of the toes, or pain under the tip of the toe. Early deformities may respond to strapping, with local paring back of the corns. For more severe deformities, the shoe may be made with an enlarged toe-box, the toe may be protected with foam tubing, or the tip of the toe elevated using soft splints. When podiatry does not give relief or requires frequent repetition, or when the deformity is severe, surgery may be considered to correct it. Surgery may be performed under local or general anaesthetic. Surgery is usually performed either as a day-case (where you do not have to stay in hospital over night at all), or with an over night stay in hospital. Surgery comprises correction of the toe deformity. A one to two inch incision made at the base of the “bent joint”, and a small piece of bone removed to allow the joint to be straightened. At the end of the operation the wounds are stitched, and the toe splinted using a fine wire, which is brought through the tip of the toe. A loose dressing is applied. After surgery it is important to keep the foot up (above the level of the heart) for 12 to 24 hours, putting it down just for transport / toilet. It may bleed slightly when put down, but this will stop if the foot is elevated above the heart again. The toe will usually be numb for six to 12 hours after the operation. You will be given painkillers to take after this. The toe should be sore but not very painful. After 24 hours it should be possible to mobilise in a pair of loose shoes or a sandal and most people are able to return to work at about seven to ten days after surgery. The stitches will be removed at two weeks, and the wire at four weeks. Removal of the wire does not usually require any anaesthetic, and is relatively painless. Although foot function returns rapidly, the toe usually stays swollen for many weeks after surgery, and does not start to regain strength until about six weeks after the operation. A reasonable expectation at an interval after surgery is to achieve a toe which is straight, stiff, of correct length and contour (maintaining the natural cascade of toes across the foot), and most importantly comfortable within a shoe and free from corns. All surgery has some risks. It seems that most of these risks are increased by smoking, and if you smoke you should tell your surgeon and discuss this openly. Approximately 90% of the patients are satisfied following surgery, but occasionally despite the great care taken, the foot is worse after the surgery than it was before. The commonest complication after this surgery is wound infection, which presents with painful swelling of the toe in the days after surgery. If you find the toe getting more painful, and especially if the pain is not relieved by elevation and simple analgesia e.g. Paracetamol, then you should notify your local doctor who will prescribe antibiotics. About one in 20 patients develop some degree of recurrence of the deformity after surgery. Despite the great care taken with surgery, the small nerves and blood vessels of the toe can be damaged by the surgery. This most commonly causes reduction in the sensitivity of the foot. Following surgery the toe can occasionally become sensitised and painful. Usually this can be corrected, with cushioning, or even further surgery. Occasionally it is permanent. If you want to know more about any of these points, please contact your surgeon. Try to ask any questions before you come in for surgery, but failing this ask them as they arise during your care.